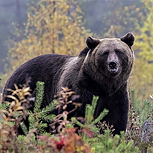 Finland is one of the last bastions in Europe for once prevalent predators such as Brown Bear and Grey Wolf: add the incredibly secretive and powerful Wolverine into the mix and you have a trio of mammals to whet the photographic appetite. We have been travelling to Finland for many years now and so our experience is of a very high standard and for this trip, we will be working from three different bases in remote north-eastern Finland. By using the different bases this will offer the best opportunity to photograph all three species in beautiful Autumnal conditions at this time of the year. We will be spending a combination of days and nights in purpose-built and professionally placed photographic hides offering an array of habitats and each carefully managed to attract one or more of these iconic species. This will be a tiring trip but with the potential images, and just as important, experiences on offer its rewards will be well worthwhile. Day 1: Travel to Kajaani airport in Finland where we will pick our hire van for the 3 hour transfer to our first base of the trip. (We will send out the flight recommendations nearer the time). Days 2 – 3: We will have the mornings to explore the general taiga forest and photograph small forest birds at a feeding station at our base before we head to the purpose built hides for the afternoon and evenings with brown bear being our target for this first part of the trip. The bears will be busy piling on the last pounds possible at this time of year and so we will look to be photographing them in the beautiful pallet of colours that the brief Finnish autumn has to offer. We leave the hides at dusk and back to our base for an evening meal. Days 4 – 5: We leave in the morning to transfer to a new base for the next 2 nights. Wolves are our main target at this location and our local Finnish guide has been feeding them for over thirty years. During the autumnal months they can usually be fairly reliable but we are talking about wild wolves and they can be so unpredictable. You may also get the chance to further photograph brown bears at this location. We will head to the hides each afternoon to spend the whole evening/night in the hides. Different hides offer different opportunities and settings so there will be scope for variety to your images. One set of hides overlook a forest clearing and the others look out over a boreal pond. You will spend 12-13 hours in these hides and so you have to be prepared for this. There is room to lie down and sleep though in the hides. 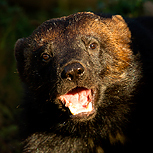 Days 6 – 7: A change of emphasis for these next two nights as we move to a forest-based set of hides to focus on Wolverine as our main target species. We will be transferring during the morning to a new base camp which will take around two/three hours’ drive. Our base for the next two nights is a rustic hunting lodge. We will spend the whole afternoon/evening in the hides which takes two people in each hide. The last time we visited there was a lot of activity as a female was visiting with her two cubs and there was also a large male visiting too. In our opinion this is the best place to see and photograph these shy and powerful animals. Days 8 – 9: We will then be transferring back to our previous base for more opportunities to photograph wolves. Again we will be spending the whole evening/night in the hides photographing these beautiful predators set amongst the autumnal taiga forests. Day 10: After breakfast, we will travel to Kajaani airport for our flights home. Accommodation, all local transport, entry fees, and all meals. Accommodation is based around three different bases with all there own unique charm. Our bases for the Bears and Wolves are typical Finnish lodges with everything supplied. Our base for the wolverine is in a rustic old hunting lodge with exquisite charm it is basic accommodation with no electricity or running water, so basic toilet and washing facilities. Single room supplements are available on request. Long hours are spent in the suitably equipped hides though, as we will be spending the whole nevening/night in them so you will need good stamina for this type of photography. The walks to the hides is minimal.